The soccket is a soccer ball that captures energy with every kick. Fifteen minutes of play produces three hours of light. Part of the Members Project from American Express and TakePart.Thd Soccket captures energy from kicking, dribbling and throwing. 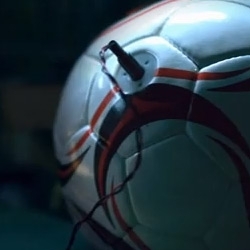 Kids can play a game, then bring the ball home and charge a LED lamp, cell phone or battery.